Shane Chartrand grew up in rural Canada between Calgary and Edmonton. His adoptive father taught him to hunt, fish, and respect his indigenous Enoch Cree Nation roots. Chartrand got his professional start when he was 14, washing dishes at a “dive” and working his way onto the line by 17, when he decided to move to Edmonton. After graduating from Northern Alberta Institute of Technology, he ran franchise restaurants but didn’t find it particularly soul-satisfying. Chartrand changed courses, honing his craft at some of Edmonton’s best restaurants: Hotel McDonald, Sutton Place, and Union Bank. As Chartrand ascended the culinary ranks, he also became involved in the community. He’s an advocate for such charities as Make-a-Wish and the Canadian National Institute for the Blind. Chartrand also teaches cooking classes to indigenous youth and is a member of the Alberta Ate Chef Collaborative. 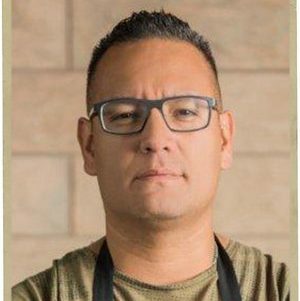 Today, he’s executive chef of River Cree Resort & Casino. Shane is also writing his own book Called: MARROW, progressive Indigenous Cuisine.